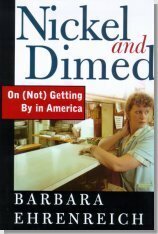 My niece shared the following quote from Barbara Ehrenreich in Nickel and Dimed: On (Not) Getting By In America. Ehrenreich, a Ph.D. researcher and writer, went in cognito as an unskilled laborer for nearly a year, trying to live on wages she received as a maid, a table waiter, and a Wal-Mart shelf stocker (conclusion: she couldn't long survive). Ehrenrich is also an athiest, but one who has at least read the Sermon on the Mount and knows enough about what Jesus really said and intended to pass fair judgment on the contemporary church. I accept the following comment as an indictment on the church (and a not-so-gentle nudge for us to change our ways! ), not as carping criticism. "It would be nice if someone would read this sad-eyed crowd the Sermon on the Mount, accompanied by a rousing commentary on income inequality and the need for a hike in the minimum wage. But Jesus makes his appearance here only as a corpse; the living man, the wine-guzzling vagrant and precocious socialist, is never once mentioned, nor anything he ever had to say. Christ crucified rules, and it may be that the true business of modern Christianity is to crucify him again and again so that he can never get a word out of his mouth."